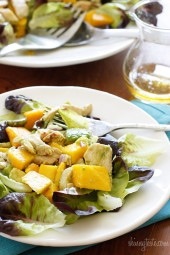 A light and refreshing salad, perfect for a hot summer day. 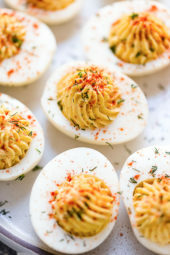 The Old Bay seasoning gives it a little kick, the cucumbers and celery give it the perfect crunch. 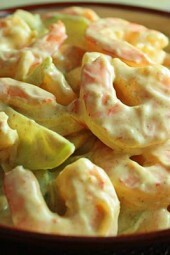 In a medium bowl, combine sour cream, mayonnaise, lime juice, Old Bay and salt. Add shrimp, celery, cucumbers and mix. I made this last evening for dinner and it was very good!!! I also added a little fresh dill, chopped, to the sauce! Made this for lunch today-SO good! Nice and light and super easy. I boiled the shrimp in Old Bay and salt and also added extra Old Bay to the dressing. Thank you for another great recipe!! My mother used to make something similar to this and it was incredible. It was chopped more like a chunky dip and served with Old London whole wheat melba toast. I am definitely trying this one out! All your recipes look amazing! I made this today – Delicious!!! My husband and I had a hard time not eating it all in one meal. I did use precooked shrimp to save time, and I sprinkled a little extra Old Bay on top. Other than that, I made the recipe as is. Yum-o! I don't know of a substitute for Old Bay, but I've never had trouble finding it. I should mention that I've never found it on the spice isle. I always find it right around the meat/seafood counter. So i feel a litte dumb asking this but what is Old Bay seasoning? I've never heard of it and my grocery store didn't have it. Also is there something else I can use as a substitute for it? Look Great! 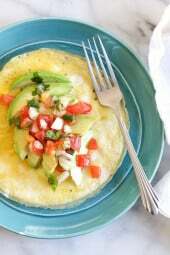 What are the nutrition facts for this recipe? @Jann- Ooh, almost forgot about this one. I think I'll make this one again this week! I LOVE shrimp and this looks so good! I will have to try this and soon! This recipe is the gift that keeps on giving. The seafood guy at Safeway even asked why I was buying a pound of shrimp so frequently! Tonight, I did the jalapeno thing, but realized I was out of light mayo. However, I did have some Kraft Fat Free Thousand Island Dressing – so I substituted. I also added a little low salt ketchup to increase the tomato taste. It was great! Kind of like Shrimp “Louis”. Patrick that’s a great idea! I’ll have to give that a try! Peter, how prescient of you! I just came back to this comments section to say I used this basic recipe to recreate an old favorite pasta salad of mine, which had shrimp and dill in it! It also had tons of mayo and olive oil – but with a couple of minor changes to this recipe, it was every bit as wonderful as my old favorite. Possibly better, because it’s better for me! I added dill weed to this recipe and it was excellent. Thanks Patrick! I love to cook, eat and garden as well! Food is all I think about 🙂 Of course, I have my days when experimenting doesn’t work out, but those recipes don’t get published. It’s a challenge remaking some favorites without all the fat and yet still tasting like exceptional, but I enjoy the challenge. And for full disclosure: I used Seasoned Rice Wine Vinegar instead of the lime. My lime tree is bare right now! :/ So, whenever I see a recipe that calls for just a bit of lemon of lime, and I don’t have one, I substitute the vinegar. Seems to me the point is to add a touch of acid for brightness, and a bit of sweetness, and SRWV does both, without having to run to the store. I stumbled onto your website just yesterday. Let me say, as a person who just started WW, who LOVES food, LOVES recipes, LOVES cooking and LOVES vegetable gardening, your website is truly a spectacular find. I made this recipe tonight – unbelievable! Your recipes are all so simple to pull together – and anyone who cooks a lot just “knows” when a recipe is going to work or not. I’ve not seen one on this site that I don’t think will be exceptional. Thanks, Gina – I’m excited about WW, and your website will be a constant companion. This is a great site! I found it through entrecard and just bookmarked it! 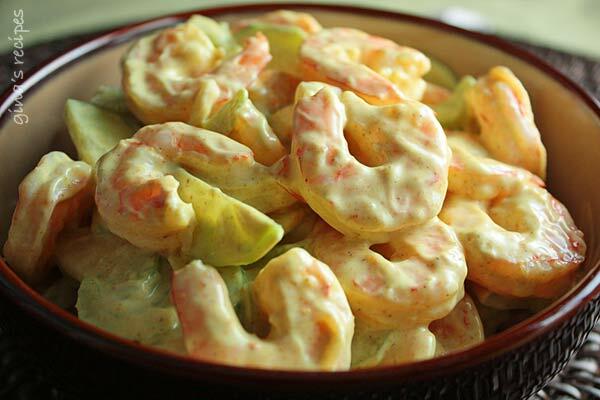 This shrimp salad looks yummy! !